Introduction: Choledochal cysts are rare cystic dilatations of the biliary tree. Though their etiology is uncertain, these cysts are usually referred for surgical resection because of their association with developing malignancy. Traditionally, choledochal cysts have been classified under five main types. Not included in this classification are cysts of the cystic duct (“Type VI”), a condition that is even rarer, with only 14 cases reported in the literature to-date. We describe one such rare case of “Type VI” choledochal cyst which we successfully treated via laparoscopic resection. Methods and Results: A 41-year old male was found to have a biliary abnormality on a routine follow-up computed tomography (CT) scan for an unrelated medical condition. Further magnetic resonance cholangiopancreatography (MRCP) imaging identified a cystic dilation consistent with a Type II choledochal cyst. Laparoscopic resection was performed using a total of 5 trocars, at which time a cyst of the cystic duct was found instead of the expected Type II choledochal cyst. Intraoperative cholangiogram was used as a surgical adjunct to confirm the anatomy and resection of the “Type VI” cyst was completed without complications. Conclusions: Laparoscopic excision is a safe and effective technique for treatment of cysts of the cystic duct. Intraoperative cholangiography is a useful adjunct to confirm the biliary anatomy during laparoscopic resection of choledochal cysts. 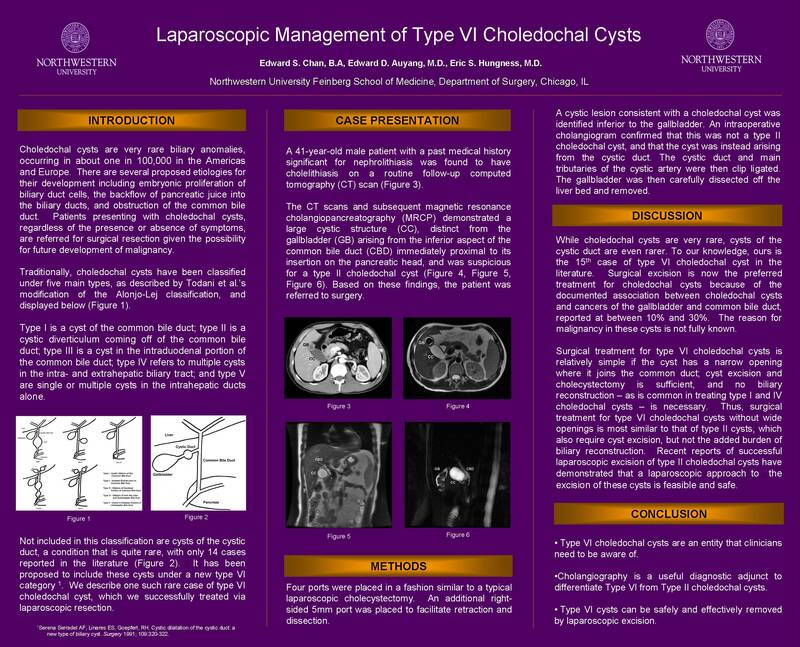 In addition, we recommend modification of the Todani classification scheme to include Type VI choledochal cysts.